It had been a long ol’ while since I’ve had my hair done at a salon (I’m talking years and years). I had forgotten how lovely it is to be pampered a little. 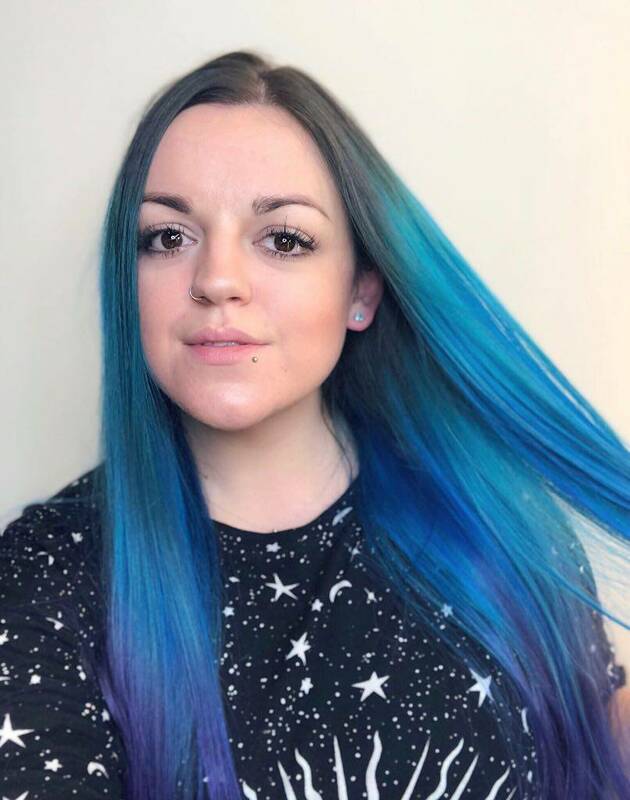 Thanks to an instagram message from Mitch Zidu (@Mitch_Zidu) who works at Danny Oh Salon in Islington, I had my mermaid hair dreams realised again, even better than before! 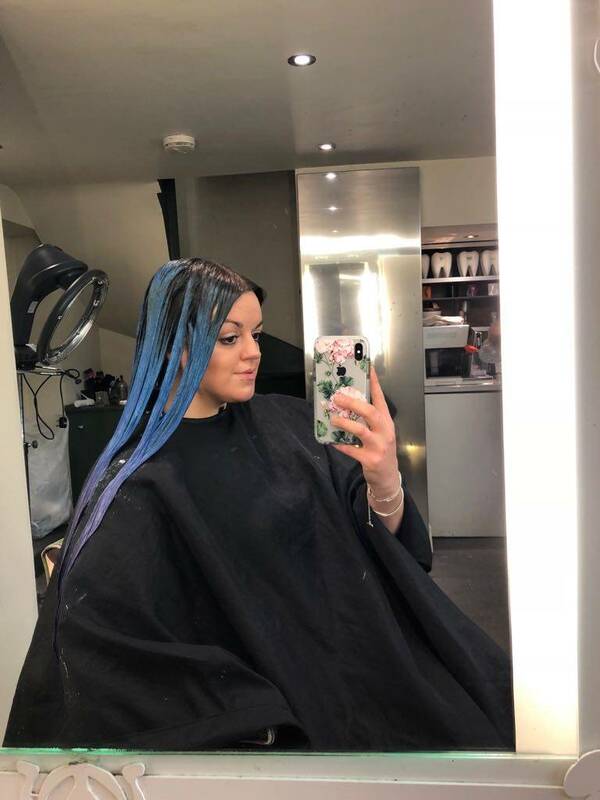 The green/blue my hair had been, was fading big time and the section that hung by my face was a muddy grey colour – which wasn’t making me feel my best! We decided not to bleach my hair from the roots to not only save my scalp, but also because I think I sorta suit the grown out, big roots kinda look? Instead we went for similar style to when I first dyed my hair green. Mitch started the bleach a few inches from my scalp so it’s not going to look so obvious as it grows out. 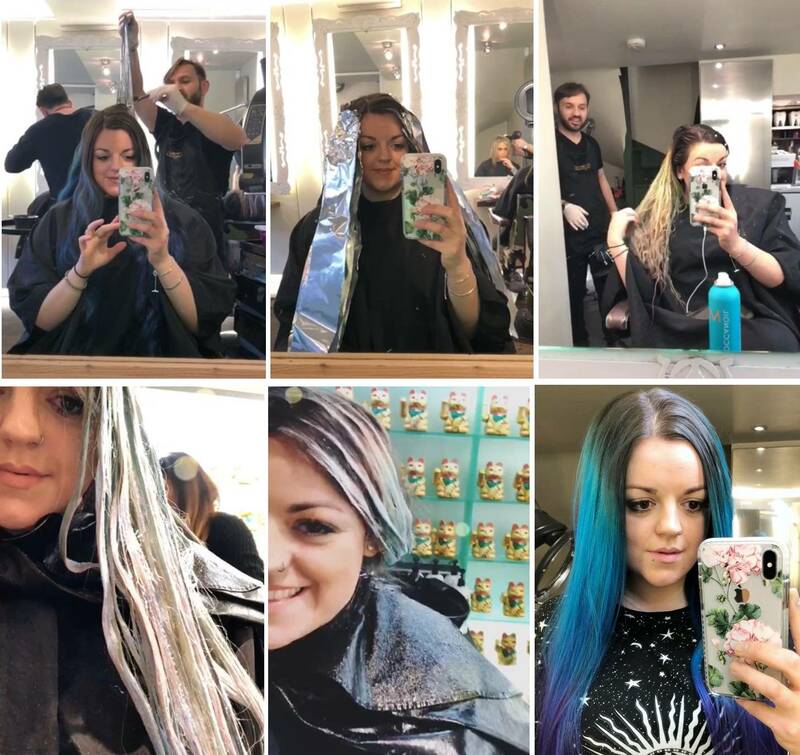 As you’ve probably seen from the photos in this post so far, my hair is pretty long… So the foil sheets Mitch used whilst bleaching my hair made me look like some kind of jazzy millennial tin man mermaid. Olaplex Number 1 was mixed in with the bleach. Next up the colour! 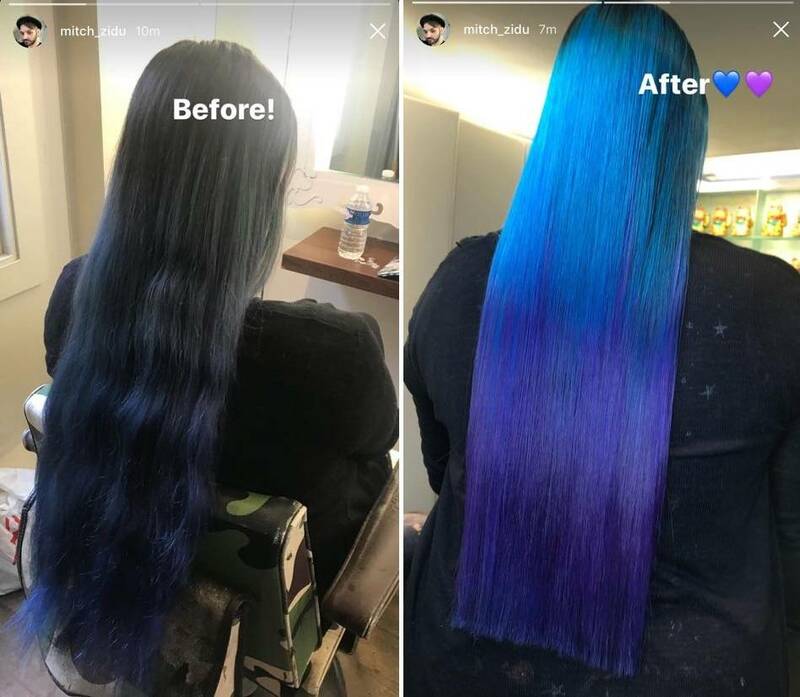 Despite the bleach a little of the pesky green was sticking around, so we decided to use blue for the lengths, blending into purple on the ends. The dyes we used were Manic Panic and Directions, both of which are Vegan & Cruelty-Free (of course – always looking out for the animals). For the blue part of my hair, Mitch mixed up Manic Panic Rockabilly Blue & Blue Moon, and for the purple: Manic Panic ‘Ultra Violet’ and Directions ‘Plum’. The final colours for each section ended up being a fun custom mix, which I’m not entirely sure I’ll manage to replicate myself at home, but I’ll give it my best shot. Finally Mitch gave my hair a little trim (which it was seriously in need of! ), then dried it off and made it poker straight. 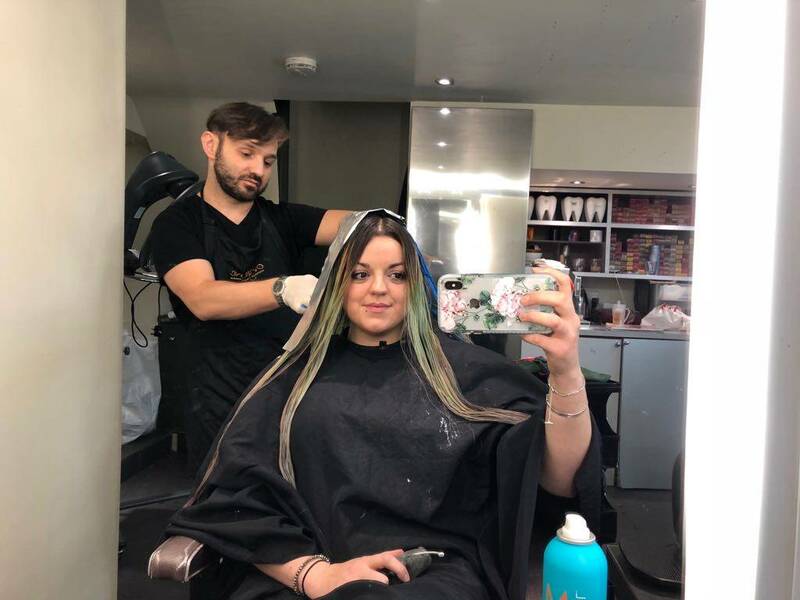 Overall the process took an entire Sunday afternoon – so if you’re in the market for a vibrant new colour be aware it takes time. It’s been 3 weeks now since my appointment and the colours are still vibrant, blending beautifully from blue to purple and despite a hell of a lot of bleach it isn’t too dry either. Woo! I love that changing up my hair colour is a fun way for me to alter my look a little, and also express myself. It’s also a great way for someone that wears a whole load of black (me) to look a little more colourful and less goff (no shade at the goths, I just like bright colour too!). Dying my hair an “out there” colour is a whole lot less permanent than getting a new tattoo, and keeps my mum happier (mum hates tattoos). I’m so lucky I’ve ended up working in an industry that doesn’t mind the whole colourful hair/alternative style! Mitch and I have been talking on Instagram since shortly after I dyed my hair green. I’m so glad, that after months of messages back and forth we finally managed to find a day that suited us both and freshen up my hair and make me feel like “me” again! For the colour this would be £250 and the cut/style £54. If you want your hair done by the the fabulous Mitch, you can find him on instagram @Mitch_Zidu and slide into those DMs for enquiries. 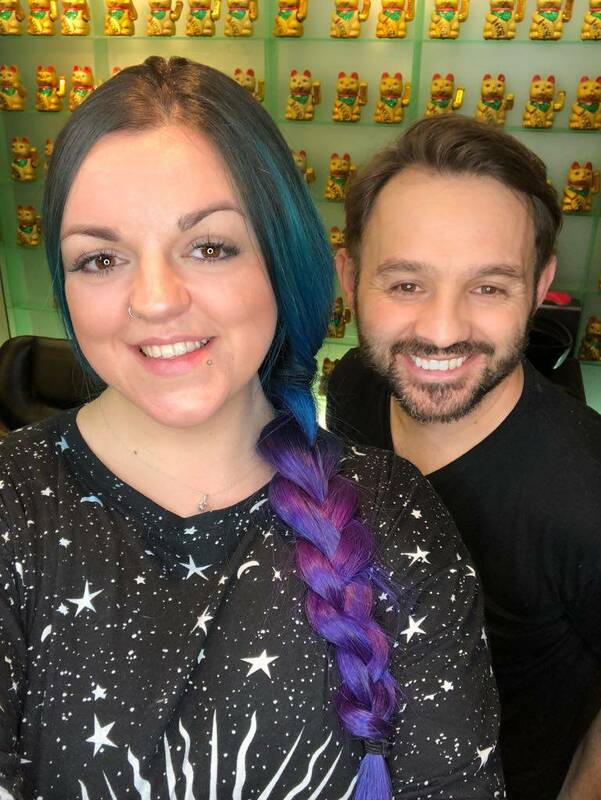 Mitch very kindly did my hair free of charge, however this hasn’t affected my opinion of the experience or outcome – I wanted blue & purple mermaid hair and that’s definitely what I got! Thanks Mitch! Love it, it looks amazing! I love doing bright colors too (mainly purple) but they always fade soooo quickly for me! I used Manic Panic over the weekend and it was bright the first day and now has faded almost completely – and I haven’t even washed it. I do “no poo” anyway so even when I have washed it for past dye jobs it’s only with water. I don’t get it, it’s so frustrating, I just wanna have purple hair! Haha. Any tips?! Thanks so much Sam!! 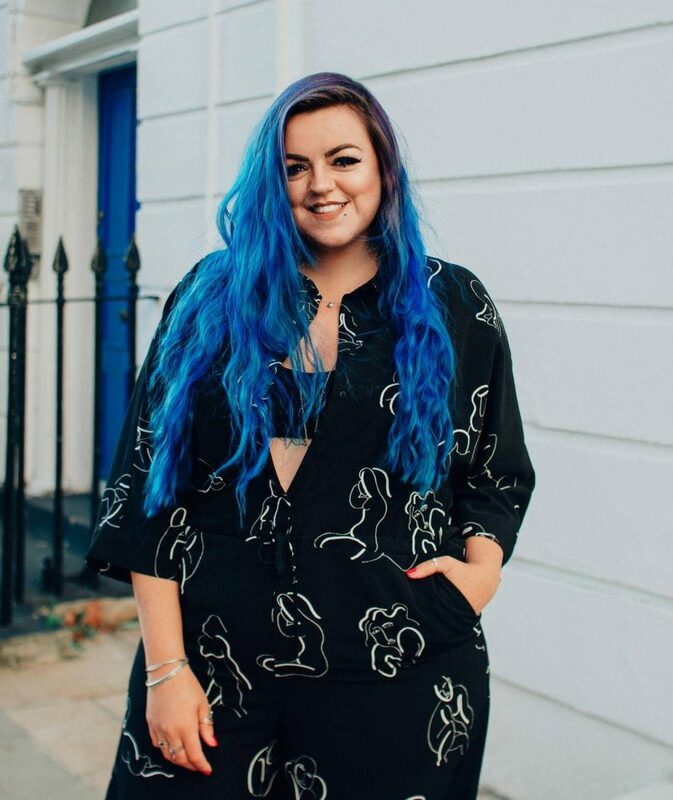 I’ll be honest I’ve not used Manic Panic for that long – Directions and Crazy Color were always my ‘go to’… Recently I’ve been using Arctic Fox too which was lovely and smelt delicious but it’s quite expensive! (Also when I had purple hair I used a dash of Directions ‘plum’ mixed with Crazy Colour ‘atomic pink’ and it made such a gorgeous purple which faded pink rather than blue like so many purple dyes go!